Vulnerable children are "not being protected" by a city council, according to a damning report. Ofsted has rated children's services at Stoke-on-Trent City Council "inadequate", and said there had been a "corporate failure" to address serious and widespread problems. The report said the council had "seriously declined" since the last inspection in 2015. The authority said it was taking immediate action to make improvements. Labour MP for Stoke-on-Trent Central, Gareth Snell, described it as an "outrageous dereliction of duty". Ruth Smeeth, Labour MP for Stoke-on-Trent North, said: "The people responsible for keeping our kids safe have failed us, they've failed our city, and they've failed our families." Leaders were ineffective in "prioritising, challenging and making improvements"
The council - an Independent and Conservative coalition - said it was making an immediate multimillion-pound investment and had appointed a new management team. A Department for Education (DfE) spokesman said it expected the council to improve "as a matter of urgency" and was "in the process of appointing a commissioner to direct the urgent improvement of children's social care services". The commissioner will support the council in its improvements for a year, at which time a decision will be made on whether it needs further support. Council leader Ann James, a City Independent, said the authority was taking the ruling "extremely seriously" and was "very concerned by the findings". "I'd like to reassure families that we have listened closely to all the comments from inspectors, have identified areas where improvements need to be made, and welcome the support of Ofsted and other partners in helping us to address these issues as quickly as possible," she said. City Independent councillor Janine Bridges, lead member for children's services, "reassured families" the council was "determined to drive the changes that are needed". "We have to get the foundations right so that we can deliver a service that is fit for the needs of young people today," she added. 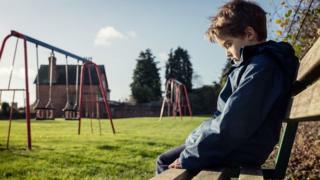 Natalie Ornelas, senior officer for charity CAF Staffordshire, which provides support to children in Stoke-on-Trent, said: "Agencies in the city are too focused on visible problems, e.g. homelessness, adult mental health and anti-social behaviour. "Because these issues are there, we see them when we walk home, we see them on the news, we are not focusing on what is going on for our children. "Our children are this city's future, yet they are being failed on a daily basis." Jack Brereton, Conservative MP for Stoke-on-Trent South, said he wanted to see "some rapid improvements" and had been "reassured some steps have already been taken, such as the establishment of an improvement board that meets weekly". The DfE said 44 councils had been lifted out of intervention with the support of a commissioner since 2010 and had not fallen back.